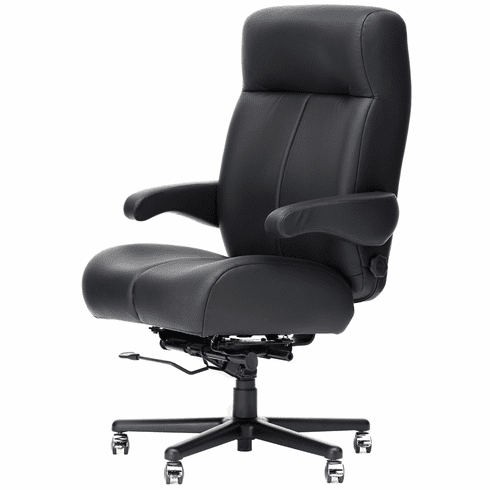 ERA Premier Executive Office Chair - Free Shipping! Why is this chair called “Premier”? Simple. It’s the absolute first when it comes to strength, with an all-steel frame that boasts a lifetime warranty. It’s also because ERA Products knows that sometimes large people need to be put first – this chair is rated for up to 500 pounds, and offers extra-wide, extra-thick seating for bigger workers. It’s also fully adjustable, has 2-way lumbar support, and sacrifices absolutely nothing when it comes to style. You get the strongest steel frame in the world, upholstered in vinyl, fabric, or vinyl plus leather. You can even select a full-leather option, and whatever you choose is backed by a limited lifetime warranty. Other features of the Premier executive desk chairs with optional leather include thick premium foam cushioning with deep contours, floating spring suspension in the seat, 2-way adjustable lumbar support, adjustable seat depth, rocker reclining seat back, tilt tension adjustment, pneumatic seat height adjustment, 360-degree swivel, flip-up arms for easy entry/exit standard, optional height/width adjustable task arms available for an additional charge, heavy duty 28" aluminum base, optional all steel 30 inch base upgrade available, heavy duty all steel frame nylon casters are standard or choose the hard floor casters available at no additional charge. 500 pound weight capacity. Designed by a leading auto interior manufacturer, each chair is individually crafted upon ordering and entirely made in the USA. Meets or exceeds ANSI/BIFMA standards.